This thread is a resource for getting information about real life weapons, armour and tactics. The concept has always been that the information is for RPG players and DMs so they can use it to make their games better, thus it's here rather than in Friendly Banter. This thread is for asking questions about how weapons, armour and tactics really work. As such, it's not going to include game rule statistics. If you have such a question, especially if it stems from an answer or question in this thread, feel free to start a new thread and include a link back to here. If you do ask a rule question here, you'll be asked to move it elsewhere, and then we'll be happy to help out with it. Any weapon or time period is open for questions. Medieval and ancient warfare questions seem to predominate, but since there are many games set in other periods as well, feel free to ask about any weapon. This includes futuristic ones - but be aware that these will be likely assessed according to their real life feasibility. Thus, phasers, for example, will be talked about in real-world science and physics terms rather than the Star Trek canon. If you want to discuss a fictional weapon from a particular source according to the canonical explanation, please start a new thread for it. Please try to cite your claims if possible. If you know of a citation for a particular piece of information, please include it. However, everyone should be aware that sometimes even the experts don't agree, so it's quite possible to have two conflicting answers to the same question. This isn't a problem; the asker of the question can examine the information and decide which side to go with. The purpose of the thread is to provide as much information as possible. Debates are fine, but be sure to keep it a friendly debate (even if the experts can't!). No modern real-world political discussion. As the great Carl von Clausevitz once said, "War is merely the continuation of policy by other means," so politics and war are heavily intertwined. However, politics are a big hot-button issue and one banned on these boards, so avoid political analysis if at all possible (this thread is primarily about military hardware and tactics). There's more leeway on this for anything prior to about 1800, but be very careful with all of it, and anything past 1900 is surely not open for analysis (These are arbitrary dates but any dates would be, and these are felt to be reasonable). No graphic descriptions. War is violent, dirty, and horrific, and anyone discussing it should be keenly aware of that. However, on this board graphic descriptions of violence (or sexuality) are not allowed, so please avoid them. A few additional comments following the premature demise of the last thread: Words from Roland St. Jude. With that done, have at and enjoy yourselves! Are there cases of concepts analogous (even roughly) to qi/ki/chi/jin/jing/internal power/whocares/etc appearing in the historical literature on Western martial arts? If so, what are these concepts like and what European cultural concepts do they relate to? D&D is its own momentum and does its own fantasy. It emulates itself in an incestuous mess. A less stupid take on alignment. A less stupid take on elves. How to avoid death as a dragon. How the Owlbear Got Its Owl Head. Yay, i have to admit between missing the previous threads whatever it was and the long lock for review i was starting to get really worried. I've never heard of it and given the world view of the Abrahamic religions I wouldn't expect there to be. Chi etc. only seem to exist as a martial concept in cultures that view god/enlightenment/etc. as an internal thing, to some degree. Enlightenment comes from within and so on. In Christianity, on the other hand, enlightenment comes from God, and though man was made by god we are separate from him. The prophets didn't sit down under a tree for a good hard think, they encountered angels or burning bushes. The fastest animal alive today is a small dinosaur, Falco Peregrino. It prays mainly on other dinosaurs, which it strikes and kills in midair with its claws. I too am very interested in this chi question. If I were to write a fantasy setting, it wouldn't make sense for Europeans to not be copying the whacky chi powers of East Asia, were they so powerful. I'm sure there's something there for Hermetic theory/Gnostic thought, but I don't know enough about either of them to say for sure. I've been reading some... I think it was called Xianxia, where everyone cultivates chi for superpowers. Demon beasts, disembodied masters and alchemical pills... They really use these ideas over and over again, so I'm wondering where it's all from, and if Europe has any equivalents... but I think it's the wrong thread. I had my own question i really wanted to ask while this thread was locked... but it's been locked for so long that I forgot! Last edited by The Jack; 2018-10-16 at 11:32 AM. Those Taoist sects revered divinized sages, but what they offered to its adherents were a set of practices that supposedly helped the followers to prolong their lives, and if they were good enough, become divine spirits after death, of even living gods before death. At the beginning those sects were focused on the creation of secret pills and elixirs that allowed followers to achieve longevity and immortality, but at later stages they shifted to meditative practices, breathing exercises, sexual techniques, special diets, magical rites and physical exercises, and they (mostly) changed from powerful religious-political movements into private esoteric practices that educated people discreetly practiced at home (well, martial artists, physicians, priests, exorcists... etc., tended to be quite public about it, since it helped their credibility...). Last edited by Clistenes; 2018-10-16 at 02:31 PM. I have a question that's tangentially related to this thread. Is there any good nautical fiction out there that takes place during the rise of steam? 1830ish to 1880ish? Something I've seen pop up in fantasy literature now and again is the concept of 'sword-and-bows', a type of infantry that would be trained in both a melee weapon and a ranged weapon. I know the Roman legionaries used javelins as ranged weapons, but I'm wondering if there was any established military doctrine that used troops equally proficient at a main ranged weapon (like a bow or crossbow) and a melee weapon. The ancient Persian 10,000 Immortals, maybe...? What kind of resources does a war elephant take up? How many horses, roughly, would you be able to bring on campaign instead of an elephant? Can you feed elephants through grazing/browsing alone, if time and terrain permit? WHY IS THERE NO LIKE BUTTON?! Libris: look at your allowed sources. I don't think any of your options were from those. My incarnate/crusader. A self-healing crowd-control melee build (ECL 8). My Ruby Knight Vindicator barsader. A party-buffing melee build (ECL 14). I believe it was mentioned in a prior thread that Philip II of Macedonia trained the main body of his force in both javelin and long spear, allowing his troops to shift from dense formation fighting to skirmishing as needed. It helped that many of his soldiers would have already been familiar with the javelin from their day-to-day lives, and by Alexander's era, I believe they'd abandoned the matter. It also wouldn't have been terribly unusual for heavy infantry or especially heavy cavalry in the High Medieval/Renaissance to carry a small crossbow, or a brace of pistols. It's hard to say they would've been equally proficient, but there's some interesting stuff in military manuals depicting the use of long and short firearms at close range against melee weapons. For the most part I don't think this would be the case, as line infantry were generally spear or polearm-equipped and that's just not a convenient combination with a bow or a brace of javelins or whatever. The only frequent exception to this rule I can think of are various cavalry who could more conveniently carry a variety of weapons. Cataphracts, samurai, a lot of noble cavalry in central asia and probably other formations all operated as multi-role cavalry at various points in their history. Elephant need about 200 to 600 pounds of food each day; horses need about ten to twenty pounds. Thus, one elephant eats as much as 10 to 60 horses. And letting your elephants subsist off of grazing is probably impossible - wild elephants spend 12 to 18 hours each day feeding. Last edited by InvisibleBison; 2018-10-17 at 11:56 AM. I suspect it's unlikely there's much. For the following reason, it was a transitional period with little proper nautical warfare. The period after Napoleonic wars were sort of peaceful (in relation to the immediately preceding and following periods). Despite the Crimean, ACW and Franco-Prussian wars. At least in a naval sense. Only the ACW and Crimean war had naval action of any note and a lot of it isn't going to be the type that really draws in good writing. Basically, we are in a period that's kinda passed over as boring between "men of iron, ships of wood" to "men of iron, ships of steel". The two capstones of Napoleonic wars and WW1 kinda steals the show. BEfore we get into dreadnaughts proper I don't think the Royal Navy's "transitional" battleships really got into a proper scrap at all. In the Crimean war they mostly shelled coastal fortifications and supported naval landings. The Russian Imperial fleet avoiding to sail out and meet their vastly overpowered opponent. And the ACW, which I think might be the best bet for backdrop you don't really have much of steamships featuring. In a recognisable role at least. Basically it's ironclads and proper naval blockaders vs blockade runners stealing the limelight. Yes and no. Truth is most ranged specialists would be fairly proficient with meleeweapons. Say Genuese mercenary crossbowmen. The problem comes in that you can't use 2 main weapons and the same time even if you brought them. So either you are a bowman or you are a spearman in the fight. You can swap over, but that probably means you are tripping over both, so you pick one role at a time. Then the question becomes maybe it's worth it to just have a second dude using that bow of yours all the time. Bonus, he doesn't have to be as trained and equipped as you. And we have the military logic of taking 2 men to do 2 jobs well instead of 1 half-assing both. Not that there weren't attempts to work with the idea. One of my favourites is the English attempt at longbow pikers in the late 1500s/early 1600s despite the bow being at least several decades past general military relevance (for them). Even the training manual picture looks awkward. What it comes back to is what I mentioned above, you can be trained to use both weapons, and exampels certianly exist of such, but you can really use them at the same time which means we are back to the 2 man 2 jobs. Eg Immortals if they were so trained would be picking one role to do, and depending on circumstances and equipment allowing he'd fill other role. But I also tihnk it'd be mor elike the Macedon troops, they'd pick for the day what their job was gonna be not mid-fight moving from "job" to another in some kdin of movie hero gung-ho Legolas/Aragorn hybrid. Now as mentioned many ancient and nto so ancient types of cavalry came equipped with the kitchensink. That's because cavalry can have a place to store extra weapons and they can more easily switch their role due to being able to ride away with the horse to "regroup". Shoot arrows, stow bow, charge with lance, retreat if necessarily, swap to bow, shoot again works better. Technically a fantasy setting shouldn't have Europeans :D.
In the Latin context though, I think IRL part of it is religious. Without going too much into RL things like chi etc etc skirts close to sorcery or magic which would be a big no no. On the Latin side you would more likely describe it as protected by god/saints/etc or being empowered by the divine. I think there's a number of such instances in the litterature. Last edited by snowblizz; 2018-10-17 at 04:06 AM. I thought the Immortals were armed with spear-and-bow, just like the regular Sparabara? Kretan archers (much prized by Alexander and the Successors) were usually sword-armed. Actual Play: The Shadow of the Sun (Acrozatarim's WFRP campaign) as Pawel Hals and Mass: the Effecting - Transcendence as Russell Ortiz. Now running: Tyche's Favourites, a historical ACKS campaign set around Massalia 300BC. In Sanity We Trust Productions - our podcasting site where you can hear our dulcet tones, updated almost every week. Further to snowblizz's comments, there's a couple of major engagements I can think of in the right sort of time period is the 1904 - 1905 Russo-Japanese War, specifically the Battle of Port Arthur. Unfortunately, the nature of the two protagonists means there's probably very little in the way of historical fiction in English. A quick google check gives me Clouds above the Hill by Shiba Ryotaro, which has been translated into English - all the other books seem to be much drier military history type books or are focused on other events happening at the same time. Wikipedia indicates there's a number of books, but they don't seem to be very focused on the rise of the steam ship. There's a number of books on the Opium Wars, but the Chinese weren't able to put up much of a fight (especially navally) against multiple Western powers. Additionally, all the books I know of, are not concerned with the naval aspect. Similarly, four of the ships in Admiral Perry's fleet that issued the ultimatum to Japan to open up were steam frigates or steam paddle ships, but there's very little in the way of 'naval' fiction regarding this (almost everything is focused on the Bakumatsu and the Boshin wars). It's mostly focused on the mechanics of the Arctic expedition, rather than the fact that they're aboard ship, but the recent TV show The Terror (based upon a book by Dan Simmons) is set in the mid- to late-1840s and features steam-and-sail ships. Yep, Philip's phalangites were dual-trained, which meant they were capable of performing the usual camp/garrison and patrol tasks outside of formal battles, and could be mobilised as skirmishers. It was indeed abandoned after Alexander used up all those veterans, because it's expensive and time-consuming to do so, and they had lots of subject peoples to draw upon for their light infantry needs. It's notable that over the same period of specialisation of phalangites as solely heavy infantry that their equipment got heavier (more body armour) and their pikes lengthened as well. Spears and javelins work just fine together. There's evidence the classical hoplite carried a javelin as well as a spear, and the Celtic influence on warfare in antiquity was such that everyone used javelins, as long as they weren't carrying a pike. As above, even pikemen might use a javelin when they weren't standing in the phalanx. The classic steppe horseman's panoply of the Skythians and other central Asian peoples was bow, javelins and dagger(s). To which a heavier cavalryman might add a lance and mace/axe/kopis. Elephant need about 200 to 600 pounds of food each day; horses need about ten to twenty pounds. Thus, one elephant eats as much as 10 to 60 horses. And letting your elephants subsist of grazing is probably impossible - wild elephants spend 12 to 18 hours each day feeding. There was an old Indian proverb about a wise king who curtailed the ambitions of a pushy subordinate by granting him the gift of an elephant. It would be bad form not to care for the king's gift, so the underling was impoverished by the act of maintaining the beast. Needless to say, you needed to be fabulously wealthy to be able to keep a stable of war elephants. Last edited by Kiero; 2018-10-17 at 08:59 AM. Proficient? For sure. Take the ever-talked-about samurai--bow plus polearm plus sword training. Use all on the same battlefield? Unlikely at best. As mentioned by others, you can't use more than one at a time, and unless you have a horse, you really can't carry most main ranged weapons along with anything other than a hanger-sized sword or the like very easily (a recurve bow worn on the hip could work with a spear in hand perhaps, that's about it). Particularly during that majority of history where a shield was a really important thing to have if you can wing it. And we have the military logic of taking 2 men to do 2 jobs well instead of 1 half-assing both. Very much on both of these. Let's not forget the English archers at Agincourt. They were primarily missile troops, but had melee weapons and did join the melee after the main lines had joined and they'd shot all their arrows. Most soldiers would carry a sword or some other melee weapon, because sometimes the enemy get too close for your bow. Most infantry would be considered to be primarily one or the other, and used as such. Archers fighting in melee was the exception, not the rule. As others have noted, cavalry often had a bow and melee weapons, but it's a lot easier to carry more gear when you're mounted. This is what made the bayonet catch on. Now every infantryman could function as a spearman and a gunner. Out of wine comes truth, out of truth the vision clears, and with vision soon appears a grand design. From the grand design we can understand the world. And when you understand the world, you need a lot more wine. Depends on the missile weapon. As mentioned, in antiquity the javelin was ubiquitous for all grades of infantry, carrying one or two wasn't a big deal. Late Republican Roman legionaries often carried a sling, which took up negligible space amongst their other gear. One thing about the bayonet, a spear is a better weapon in every respect than a musket/rifle with bayonet attached. However, the advantage of the bayonet is that you don't have to carry anything extra, and as long as you're not fighting people with spears, it doesn't matter that the spear is a better weapon. Proficient? For sure. Take the ever-talked-about samurai--bow plus polearm plus sword training. Use all on the same battlefield? Unlikely at best. As mentioned by others, you can't use more than one at a time, and unless you have a horse, you really can't carry most main ranged weapons along with anything other than a hanger-sized sword or the like very easily (a recurve bow worn on the hip could work with a spear in hand perhaps, that's about it). I'd disagree with the unlikeness of 'use all at the same time' and chalk it more up to differences in military culture. The Mongol light cavalry were both bow and sword armed and would often go for flanking attacks once the enemy had been pulled in and had been counter-charged by the Mongol heavy cavalry. Details are a bit sketchy this far back in the Muromachi period (~14th-16th Century), but chokuto and the straight tachi (大刀) were one handed, single edged short swords that were used with bows at the same time. 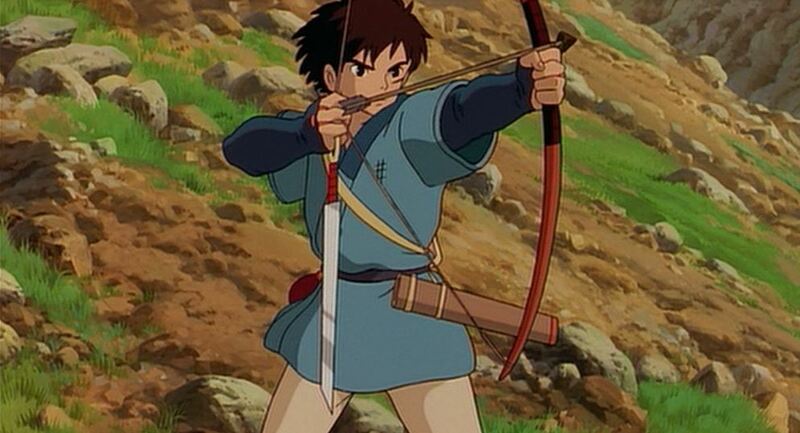 The clearest example I can find is from the anime Mononoke Hime, with the character Ashitaka. The sword itself has a ring on the pommel that allowed to be held while drawing the bow. The sword that Ashitaka uses is most likely derived from much older Chinese dao (single edged blades). You can even hold a shield while shooting with a bow: this was more typically found with more central European archery (Scythian/Hungarian/Turkish archery) - link. Edit: While searching, I found this video of someone with an axe ready while shooting: link. From a technical standpoint, he's using a three-under draw (he's using the index, middle and ring finger to draw the bow and all three are under the arrow) in contrast to the more typical thumb draw of horse archery. This leaves the rest of his drawing hand free for a light weapon nestled in the crook of the thumb. That said, I'm not familiar with Hungarian archery techniques, so I'll have to do some more research. Last edited by Brother Oni; 2018-10-17 at 10:24 AM. Sandokan? The advent of steam is described as a big deal that would sink that model of piracy, and there are some pirates vs steam engagements in The Tigers of Mompracem. Chalk that one up to difference in word usage, but that's not what I would call using them at the same time. Yes, these example are great examples of genuine switch-hitters, and the closer you can have everything to being ready at the same time, the better. These examples are cases of where that was clearly made a priority, and I'm sure the requisite opportunity-costs were carefully weighed. So your classification of 'at the same time' is that they must be dual wielding a ranged and melee weapon at the same time? Would soldiers with non-plug bayonets and rifles count (ie fitting the bayonet does not restrict the weapon from firing)? The only thing I can think of that clearly meets your criteria is before the mass introduction of cased ammunition and soldiers went into battle with a pistol and a sword, eg late age of sail era combatants (pirates, officers, etc) or American Civil War Officers armed with percussion cap revolvers and sabres. I'm not arguing that the bayonet is equal to or better than the spear. But I do think 100 men with bayonets on their muskets beat 50 musketeers and 50 spearmen every day and twice on Sunday. The bayonet can be used in melee, and can be used to present to hold off cavalry if the infantry hold steady. So it does the spear's job, maybe not as well, but the increase in firepower by having every infantryman now able to shoot is a huge advantage over the old pike and shot formations where only a fraction of the men could shoot. Nothing is necessarily supposed to meet the criteria. You generally can't use a dedicated ranged weapon and melee weapon at the same time. That was the point. That's one reason (along with carrying, and the challenges of switching between--although your examples do point out ways of addressing the switching aspect) that most militaries don't focus heavily on having troops who do both. Yikes. That's really expensive. Thanks for the answer. Oh absolutely, it's a dedicated weapon v multipurpose weapon thing. The spear is better at being a spear; the bayonet-tipped rifle is a poor spear but better than no melee weapon at all, without all the additional weight and hassle of a second weapon. That's why it's persisted so long, it doesn't have to be as good as a spear for the most part, just good enough. Put those riflemen against an equal number of dedicated spearmen, especially if they're out of ammo, and it's a different story. Such as the battle of Isandlwana (though that did have other extenuating circumstances). Is that for African or Indian elephants? Didn't work out so bad at Rourke's Drift or Ulundi. Spears beat bayonets in melee, maybe. But good luck getting to melee if you're facing rifles. Every once in a while, there's an upset, where a melee- specialized force beats musketeers, or more rarely, riflemen. But those are the exception. For every Isadlwana there are a bunch of Omdurmans. Last edited by Mike_G; 2018-10-17 at 03:16 PM.